"Design Developers" – The Newest Role in Website Design? “Design Developers” – The Newest Role in Website Design? If you browse through career opportunities in 2018, you may see a surprising new job title in website design. “Design developer,” a title coined by Andree Huk of blended.io, describes a new kind of front-end developer. Huk explains that a new job position may be necessary to make the transition from traditional visual designers to designers with technical front-end skills. So-called design developers would have the expertise of both roles. Track this major shift in website design and explore what could be a high-demand job position in the future. Visual designers must create a unified, cohesive website with the proper amount of white space, contrast, scale, and other elements that users expect. They must pull the components of a site’s visual appearance together in a seamless layout. Visual designers need to have a firm understanding of what visual elements users look for most in websites, as well as strategies such as color psychology. Visual designers are experts in what users think, feel, and experience on a website. They use this knowledge to come up with poignant visual design elements. What Does a Front-end Developer Do? It is a front-end developer’s job to create a layout, buttons, and other elements that enable users to navigate and use a website. Front-end developers also fix bugs and error messages, as well as make sure multiple platforms and devices can support the webpage. The skills most in demand for this job title are coding capabilities, knowledge of plugins, experience with CSS preprocessors, debugging, problem solving, and knowledge of responsive and mobile website design. What’s missing from Current Website Design Job Titles? The roles of visual designers and front-end developers are different, yet the two jobs go hand-in-hand. Visual designers create the visual elements of a site while front-end developers make sure they work as desired. Both are necessary for a beautiful, functional website. Currently, the two exist separately within most website development firms. Thanks to fundamental changes in website design, however, it makes sense to combine these two roles into one comprehensive professional: the design developer. Merging these two jobs could fill the gaps that currently exist in the roles of visual designers and front-end developers. For example, most visual designers do not have adequate coding capabilities to bring their ideas to fruition. Instead, they must develop graphic elements and then take these ideas to the front-end developer or other employee to install the elements onto the website. In the same vein, front-end developers can add visual elements to a website but may not have the skill set or knowledge to create these elements. The gap between visual design and front-end development naturally gives way to a third, hybrid career opportunity. Visual design is not just a website’s aesthetics. Front-end development is not just typing code. Both are multi-faceted job positions that delve much deeper into the website development process. When you combine the skills from these jobs and merge them into one position, you get a developer who can bridge the gap between the two roles – saving time, money, and limiting the odds of mistakes. Today, only a small fraction of front-end developers possesses a good eye for website design and visuals. According to Huk, this is changing. Front-end developers with visual design expertise are hot commodities seen as valuable additions to website development teams. 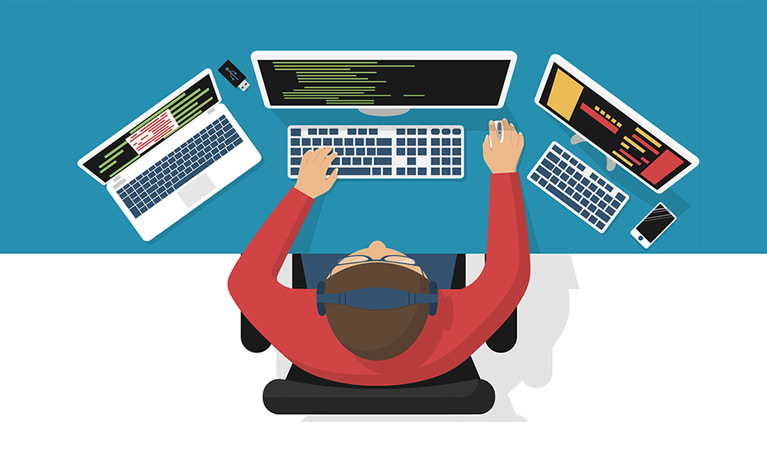 Huk believes that front-end development in software design is undergoing a “fundamental change whereby development is pulled much closer toward design.” What does this mean? The possibility of a brand-new job description. A design developer would effortlessly handle both visual-oriented design details and the technical aspects of front-end development. Design developers would be tech-savvy website designers equipped with visual design knowledge and the ability to write code. Combining two important website development roles would allow teams to create sites with less lag time and less room for miscommunications. When front-end developers also have an eye for visual design, they can quickly design and execute website elements. They would have a natural talent for design while still having the know-how to create the front end. Huk isn’t the only one tracking a shift toward design in front-end development. Others in the industry also note the blurring of the lines between design and development. Despite decreasing costs to launch software and simpler methods to create sites, it still isn’t easy to create websites that users love. This requires an understanding of visual elements as well as how to deliver an optimal user experience. A design developer is someone who would have both these talents, along with the ability to design and develop successful websites. What Would This Job Position Look Like? Should design developers come to fruition in the next year or so, expect website design teams to look for professionals with backgrounds and experience in both visual design and front-end development. These professionals would be skilled in website design, but also know how to write code and initiate solid front ends. Hiring this type of individual could eliminate required handoffs from person to person to bring design ideas to life on a website. You might be a future design developer if you have interest or experience in both the visual and technical aspects of a website. You may already use sophisticated website development tools that blend these two roles, such as Squarespace or Webflow. These are design-first website building tools that allow creators to add code to tweak the finished product. This is just a taste of what design developers could be doing in the future. Five years from now, expect to see the composition of the average website design team to change. Visual designers won’t only be in charge of aesthetics but also of website coding. Front-end developers won’t be able to turn a blind eye to a website’s visual elements. Instead, both employees will have to grasp the skills of the other – or give way to a hybrid position that blends the two on a fundamental level. Design developers would be able to act quickly to improve a site and roll out new features faster than before. Businesses would be able to deliver better user experiences without costly downtime in site upgrades. As website teams begin to blend the roles of visual designer and front-end developer, expect to see this new job title arise in the near future. If you have these skill sets, this impressive title could even be yours.